The concept of a hybrid political order is useful in understanding post-conflict state formation, in the Horn of Africa and elsewhere. For policy-makers supporting the re-establishment of government institutions in Somalia, the example of Somaliland is instructive. Hybrid political orders are not an alternative model for state-building; they are the outcome of a process of negotiated statehood and a reality to acknowledge and work with. State-building is not simply a legal and technical undertaking but a process of negotiation that occurs in an acutely political context. In Somaliland, the role of elders in relation to the state has changed: the authority of the House of Elders has diminished as formal institutions of the state have become more established and powerful. Mark Bradbury, the RVI Horn of Africa and East Africa Regional Director, began the meeting by introducing Marleen Renders, the author of Consider Somaliland: State-Building with Traditional Leaders and Institutions (Leiden: Brill, 2012). He noted that her book came at a timely moment. The new government in Mogadishu is involved in a process of state-building, and is confronted with similar challenges to those faced by Somaliland over the past two decades. Critical questions, he said, face President Hassan Sheikh Mohamud’s government as it tries to negotiate a common vision for the state of Somalia. The participants in the seminar reflected on these issues, drawing on the experience of Somaliland and other places where hybrid political orders have emerged, noting that there have been positive and negative outcomes at different moments for different interest groups. In the first panel, Marleen Renders stressed that Somaliland’s experience of hybrid political order should not be treated as a model for fragile states in Africa. Instead, the concept should be used as a lens through which to see Somaliland as it is, instead of as an aberration from normative, Western ideas about the state. There could be no equitable or sustainable state-building in the region, she argued, until policy-makers accept and understand the interactions between formal and informal institutions, and state and non-state actors. Thinking in terms of hybrid political order reveals that state-building is not a legal and technical endeavour but a process of negotiation that occurs in an acutely political context. A hybrid political order is the outcome of negotiated statehood. In Somaliland the negotiation involved a wide range of actors: politicians, elders, the military, businesses, civil society, NGOs, and the international community. These actors negotiate, Renders added, using different strategies and discourses, shifting between state-based and clan-based networks and rhetoric. Renders also raised the questions of what checks and balances may emerge in a hybrid political order, and how issues of representation, inclusiveness, accountability, and access to resources may be addressed. She argued that checks and balances are subject to continual renegotiation; as the hybrid political order shifts, these can strengthen or come under increasing pressure. Drawing on her research, Renders went on to outline how a hybrid political order emerged in Somaliland in the early 1990s, founded on informal, clan-based consensus building and mediated by influential elders who had been part of the Somali National Movement (SNM). Political issues were initially by-passed, as former enemies approached each other as clans, focusing on peace and the restitution of property. In time, as the role of elders became institutionalized in government through the Guurti (the Upper House of Elders), they lost the legitimacy and authority that they had previously enjoyed independent of the presidency. As the late President Mohamed Egal pursued international recognition for Somaliland, the political centre of gravity in the hybrid political order shifted from clan elders to state-based discourses and actors. Nonetheless, the many elections that have taken place over the past decade, she argued, have demonstrated the continuing influence of the clan system over Somaliland politics. Today, the hybrid elements that initially made peace and stability possible have become, some would argue, a barrier to equitable power sharing at the national and regional levels. The second panel considered the question of how a common vision of statehood could be achieved in a country fractured by years of conflict, and examined the significance of Somaliland’s experience in the context of the challenges facing Somalia today. 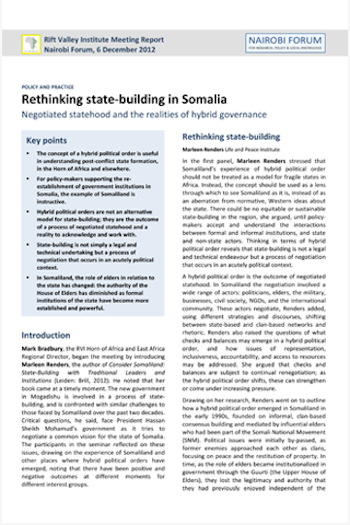 Anna Schmidt suggested that in Somalia, different ways of negotiating a common vision of statehood are available. War might shape or destroy a vision, she said, while contract-making offers another possible means for state-building. On the question of how the writing of a constitution contributes to an evolving vision of the state, she noted that there is agreement in Mogadishu on the enactment of the idea of the state—but the substance of that idea remains undecided and open to negotiation. Negotiation, though, is always an unequal process, said Mohamed Nur Mohamud. He pointed out the limits of hybrid political order by suggesting that clan elders have repeatedly failed to go beyond crisis resolution. He argued that for Somalis, real statehood in the twenty-first century means more than a hybrid mix of local and formal institutions, and must include law and order, citizens’ rights and competitive politics. Quman Akli considered the question of Somaliland statehood vis-à-vis Somalia. She asked whether a unified vision of statehood is needed or helpful at this moment. She reminded panellists of the two competing visions: an independent and internationally recognised Somaliland versus a unified Somalia. By starting with this contentious political point, however, an opportunity might be missed to engage in dialogue on other, more resolvable issues, she said. The attendance of a delegation from Somaliland at the London Conference on 23 February 2012 had established a spirit of goodwill and co-operation between the two states: how to build on this and normalize their relationship should be a priority for both governments. Ulf Terlinden stressed that policy-makers had to accept the reality of the hybrid political order even if it involves negotiating with unsavoury actors in unconventional ways. In a post-conflict situation, he noted, one seeks the glue or trust that can provide social cohesion—and in Somaliland that was the clan. But, he added, traditional authorities are limited in their capacities. He recalled that soon after brokering a ceasefire in Somaliland, clan elders complained that too much was being asked of them. The difficulties and dangers of taking elders out of their traditional roles and asking them to take on state authority recurred frequently in discussions. Should elders be extracted and placed in Hargeisa or Mogadishu and asked to define a state that would be exported and globalized, he asked, and what vacuum would be left at the local level if this occurred? Terlinden concluded by asking a simple question: what state? It is easy, he observed, to agree on the notion of the state, but the questions of what sort of state, provided by whom, and serving what ends are all complicated theoretical and practical problems. One discussant suggested that that African elites have failed to imagine a state that corresponds more intimately with African desires and identities than the Western model. The challenge then for the new government in Somalia must be to create its own road-map for state and nationhood, independent of the international community. Returning to the theme of checks and balances, the third panel was asked to consider the question of how clan-based institutions can negotiate a relationship with state and sub-state institutions to ensure appropriate representation and accountability. Abdullahi Shirwa began by stressing that accountability is essential for sustainable development and stability. Somalia, he said, needs to develop systems to guarantee accountability on the part of government and all the other non-state actors that constitute its hybrid political order: the private sector, civil society, traditional leaders, the international community, and the diaspora. But accountable leadership in both formal and informal spheres, he noted, will be difficult to secure in the absence of a functioning judiciary, watchdog groups, and a developed media industry. In discussion, the question was raised as to whom MPs are accountable. If it is to the clan elders who nominated them, then who are those elders accountable to? This led to comparisons between the political role and local foundations of elders in Somalia and Somaliland. Erik Landemalm discussed the role of the Somaliland Guurti, asking what role the upper house of elders should perform today and whether they should act as an advisory body (as they do in Puntland) or continue to constitute an upper house in parliament. In the early 1990s, this body of elders was instrumental in negotiating peace through consensus-building at a local level; in the years since then, their function had been institutionalized, their positions politicized, and their independence curtailed. This had diminished their capacity to negotiate and build consensus, with the result that many in civil society and the international community today view the Guurti as unaccountable—particularly as its membership had not been elected or selected since 1997. Landemalm asked whether a more positive role for elders—not necessarily those currently represented in the Guurti—can or should be found in Somaliland. The dangers of not finding one, he added, are currently playing out in Puntland, where the absence of an official political space for elders is creating its own set of problems. Through discussion, a distinction was drawn between the spontaneous role initially played by the Guurti in Somaliland, the deliberate anointment of elders, and the elevation of their role in Somalia in the past year as a means of moving the transition on. The policy of promoting traditional authorities encountered a problem in Somalia when not enough ‘genuine elders’ were identified to fill the committee of 135 that would select new parliamentarians. Becoming an elder itself, therefore, was the product of invention and manipulation by the media, political parties and the international community. Can elders borne out of this process, it was asked, truly be accountable to the communities they are supposed to represent? On the issue of representation, Nuradin Dirie outlined some of the difficulties faced by Somali women, minorities, and young people. He suggested that while the clan system complicates the process of nominating female MPs—did a woman, for example, belong to the clan of her birth or of her husband?—the fact that the new parliament of Somalia has an 18% female representation is nonetheless cause for celebration. He noted, however, that the participation of youth in politics in general and in the administration in particular was limited by Somalia’s present constitution, which bars those aged under 35 from serving. Given that 45% of the population is under 14, he observed, young people are the most significant stakeholders in Somalia’s future—and ways have to be found to involve them when attempting to forge a common vision of the state. He also expressed concern about the representation of minorities under a possible future ‘one man, one vote’ system. During the transition, the so-called 4.5 clan power-sharing formula—apportioning equal representation to each of the four major Somali clans, with an additional ‘half-share’ for minorities—had indeed, for the first time in Somalia's history, given minority clans some political representation in central government. Whether this should be maintained is a question for future deliberation. The fourth and final panel returned to the concept of the hybrid political order, looking at its manifestation in other contexts and considering whether such systems are a source of order or disorder. Halima Shuria outlined how hybrid political order had been established in parts of North Eastern Kenya during times of insecurity. She described how complete structural breakdown occurred in the town of Wajir in the early 1990s, when conflict between two clans escalated with the influx of arms from Somalia. The government was unable to mediate and religious leaders and traditional elders became divided by clan. The situation only stabilized when all the formal and informal actors came together to form a peace committee. Since then, the model of peace committees had been replicated across Kenya—indeed, they played a critical role in the resolution of the 2007/08 post-election violence. Although formalising a hybrid political order can institutionalize certain power imbalances, she noted, it also enables the development of a rapid response system. In the case of North Eastern Kenya, formalizing the peace committee was key to ensuring government cooperation, which was essential given the region’s particular political and historical context. Continuing the discussion on Kenya, Abdiaziz Bashir described the evolution of a programme of community policing on both sides of the border with Somalia. Where communities had historically been hostile to the Kenyan state, security forces struggled to gain the necessary trust and cooperation from local communities to tackle incidences of crime and violence. By empowering local actors and collaborating with them, significant progress has been made in combating insecurity. He suggested that, as police reform progresses in Kenya and Somalia’s new government extends its reach, this cross-border hybrid political order may become less critical. This led Markus Hoehne to reflect on the evolution of hybrid political orders. On the question of how such an order functions, he made the analogy of a seesaw: as state or formal institutions become more powerful, informal actors become weaker, and vice-versa. Secondly, he asked what sort of order is created by hybrid political systems. His view was that they create a minimal and temporary order that quickly becomes imbalanced. In times of crisis, he said, hybridity born out of negotiation offers a means to establish local peace, but such orders do not foster or promote human rights and democracy in a Western sense. As evidence, he pointed to what was viewed by some as an illegal and corrupt Guurti in Somaliland that sat between 2006 and 2010: its term was unconstitutionally prolonged by President Dahir Riyale Kahin, and the Guurti, in turn, kept the president in power beyond his mandate. Therefore, Hoehne argued, the costs for democracy, as well as the vitality and legitimacy of traditional authorities, increase when hybrid political orders are institutionalised. In conclusion, from the experience of Somaliland Hoehne cautioned Somalia against adopting a hybrid political order. Somalia could, however, be inspired by the way Somaliland in the early 1990s began to negotiate its statehood independently from external actors. In the final discussion, participants reflected on the trajectory of the seminar, which had begun by investigating hybrid political order and ended by discussing the difficulties in ensuring checks and balances as well as functional governance in this context. Do hybrid political orders compare favourably to the democratic state built according to the Western model? Renders reiterated that they do not offer an alternative model either to aim for or work against, but rather a reality to work with. Policy makers, she said, needed to recognise that structures and roles adapt, and so should seek ways to work with the patterns that emerge, in ways that make the mix of traditional and modern institutions more equitable and accountable.